While Milan had become the center of silk and textile production in the 20th century, beginning in the 1950s, Florence was the fashion capital of Italy, when “alta moda’ became the country’s own variation of haute couture. Thus it makes sense for Dolce & Gabbana, an Italian luxury fashion house founded in 1985 in Legnani by Domenico Dolce and Stefano Gabbana, to have its very own alta moda fashion shows. 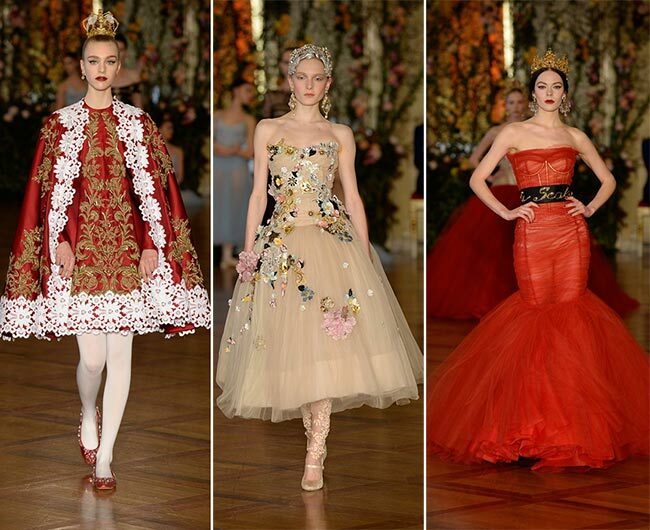 And we are head over heels with the breathtaking Dolce & Gabbana Alta Moda spring/summer 2015 collection that’s all about luxury, refinement and a high class. Of course, what better place to hold such an opulent event than at the La Scala opera house, Milan’s world-famous, neo-classical era theatre with lavish pillars and a sombre history that has never before seen a fashion show catwalk grace its grounds. Perhaps it was because no one had ever dared to ask to do it there. Dolce & Gabbana set up an alta moda show that puts specially designed fashion pricing up past the cost of your regular haute couture dress. We’re speaking only the 1% of the 1% is able to afford this and only those who love to look good and be perfectly unique at the same time. The Saudi princesses and the Russian billionaires, the owners of vast oil fields and scion’s of immensely wealthy families of concern; these are the target markets and boy is it a small one. For the last 5 seasons, Dolce & Gabbana has served this ultra-niche sector, beginning back in 2012 and carrying on to date. The night brought in a crowd of high fashion lovers, an audience decked in glittering jewels as if they were ready for a night of opera, to spend the time in red plush velvet boxes and reminisce the days of the incredible opera in the 18th century house. The Toscanini foyer was turned into a stage for the top Italian fashions, seducing potential clients who had flown in from all around. A show was created and the fashionable pieces were presented though ballet, complete with a background of music from Carmen, The Nutcracker, and Swan Lake. 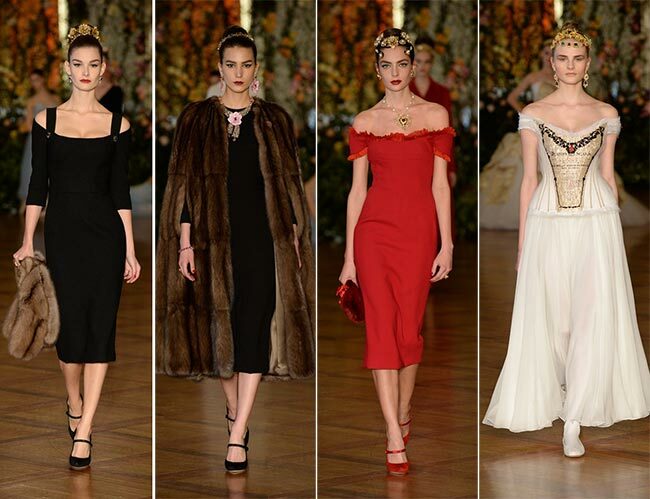 The dresses featured in the Dolce & Gabbana Alta Moda spring/summer 2015 collection themselves had laced covered in fur, curvy designs and riffs on gilded decorations. The opera house may have been host, but before the courage was mustered to ask for the venue, the designers approached the director to be allowed to showcase La Scala’s signature posters on the skirts of the Dolce & Gabanna Alta Moda dresses. 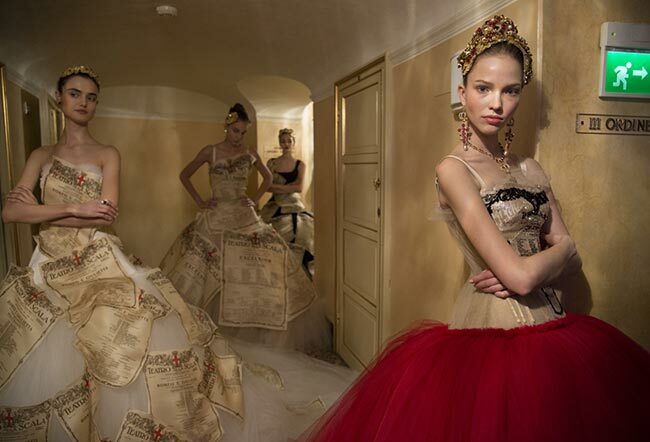 Once permission was secured, the olden red and parchment-beige posters were turned into bodices and printed onto full organza skirts. The gorgeous organza fabrics with floral decorations with the strapless designs and full skirts, as with this piece had us falling in love immediately. We are looking at tight bodices, midi hems, and lace stocking with velvet shoes the color of snow. 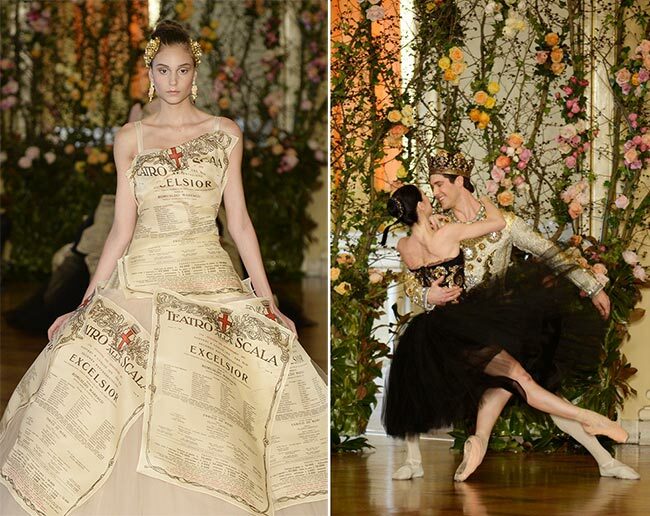 Each number presented is more breathtaking than the last, making the whole of the Dolce & Gabbana Alta Moda spring/summer 2015 collection simply too beautiful not to capture the attention of the clients sitting in the crowd. 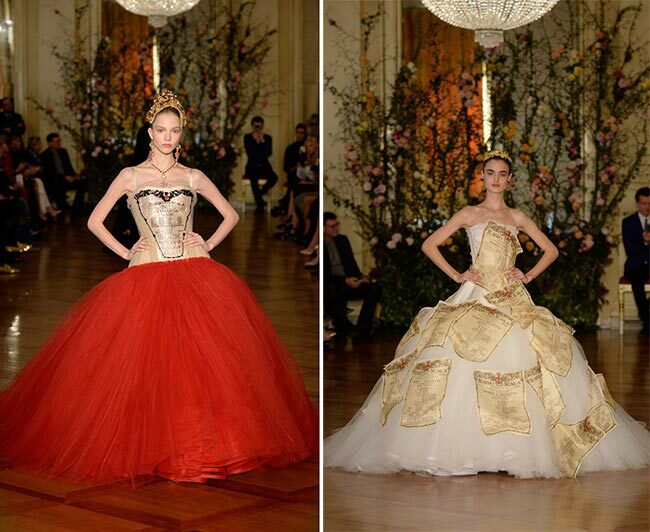 The floral conceptions continued on, with so many of the dresses boasting their breathtaking combinations with ballet and opera-worthy gowns. The individually stitched petals on each of those sizeable roses looked incredible, particularly as they were bright pinks with red and purple hues against the black background. It certainly is easy to imagine such a gown adorning the figure of a Russian mogul’s wife.